When Skippy and Dave and friends take the stage you are in for a real treat. 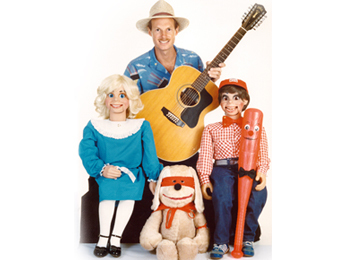 Dave Parker is a skilled ventriloquist and an accomplished guitarist. He and his wooden friends have opened concerts for comedian A.J. Jamal (“In Living Color), actor David Newell (Mr. McFeely from “Mr. Roger’s Neighborhood”) and magician David Copperfield and now Skippy and Dave are here with YOU! One minute you will hear a disembodied voice calling from offstage, another time you will hear a favorite song from one of Dave’s recordings, and before you know it, you might be up onstage for “volunteer ventriloquism” or playing a rhythm instrument in ”the band”. With enthusiasm and style, this talented team brings nonstop fun to everyone!